It’s time for our second round of ‘7 Walt Disney World Resorts in 7 Days!‘ We did the first round back in January where we covered Port Orleans French Quarter, Port Orleans Riverside, Caribbean Beach, All Star Movies, Pop Century, Animal Kingdom Lodge, and Wilderness Lodge. This time around we’re doing things a little bit differently though – instead of releasing a resort a day for a week, and doing only one DIS Unplugged segment for all of them, we’ll be releasing one or two resorts every Tuesday for the next four weeks with individual podcast segments. This way we were able to spend plenty of time talking about each resort! 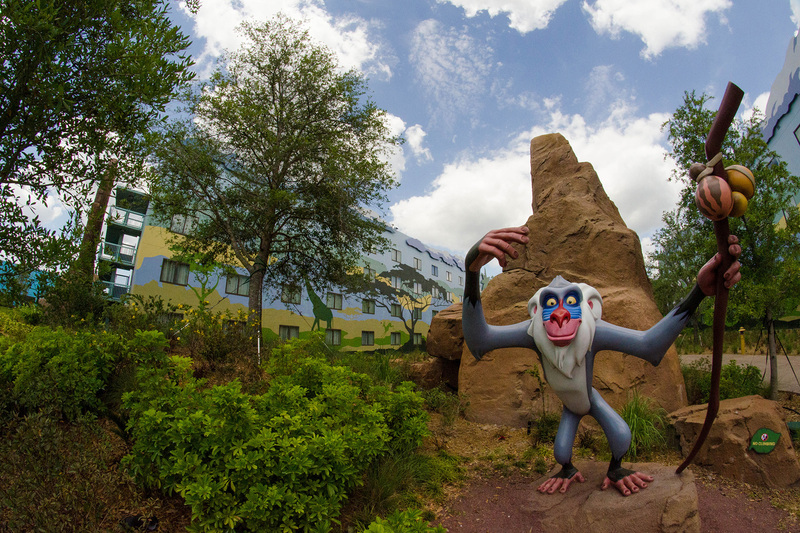 The first resort we’re covering is the newest at Walt Disney World Resort – Disney’s Art of Animation! 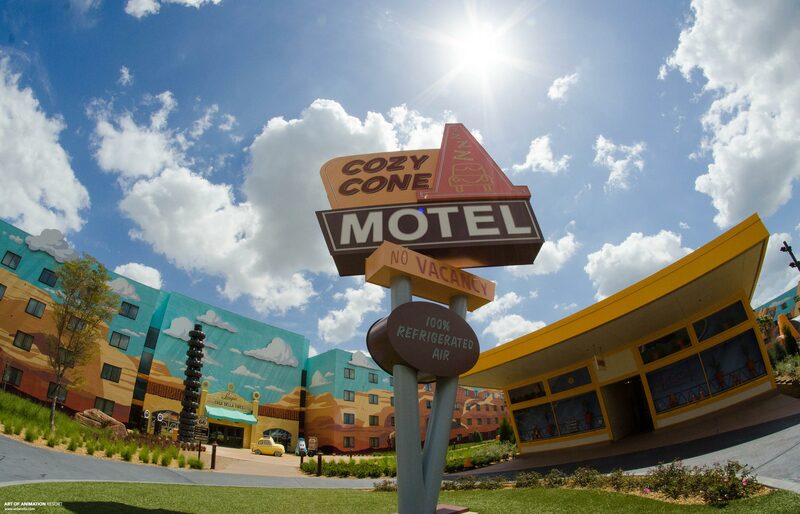 Located across from Pop Century, the spot was originally going to be a sister resort to Pop which covered the early part of the 20th century. 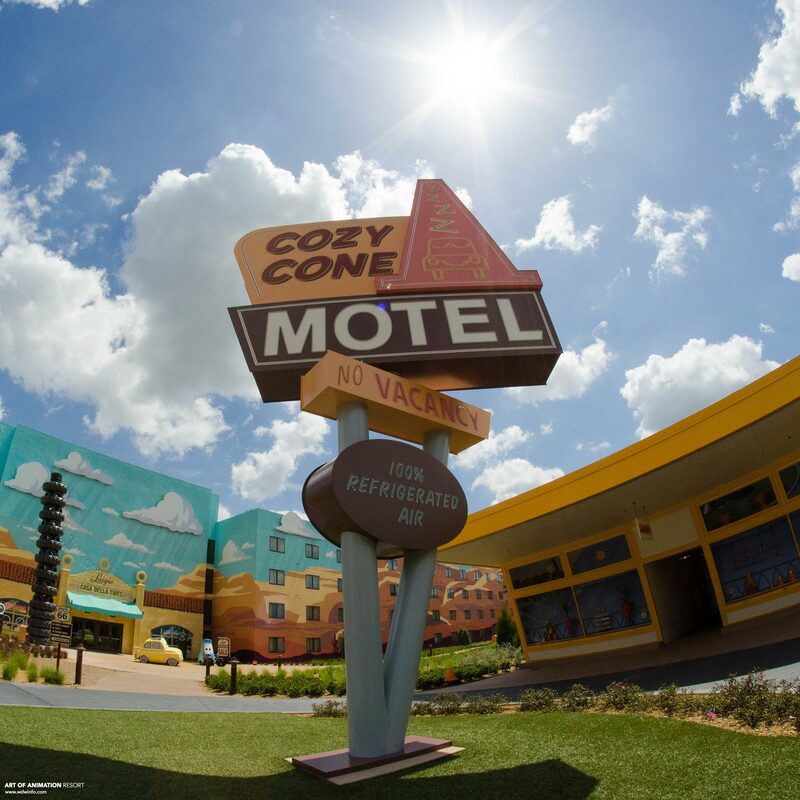 After being cancelled years ago, the few buildings that were built sat dormant until Disney began developing Art of Animation. 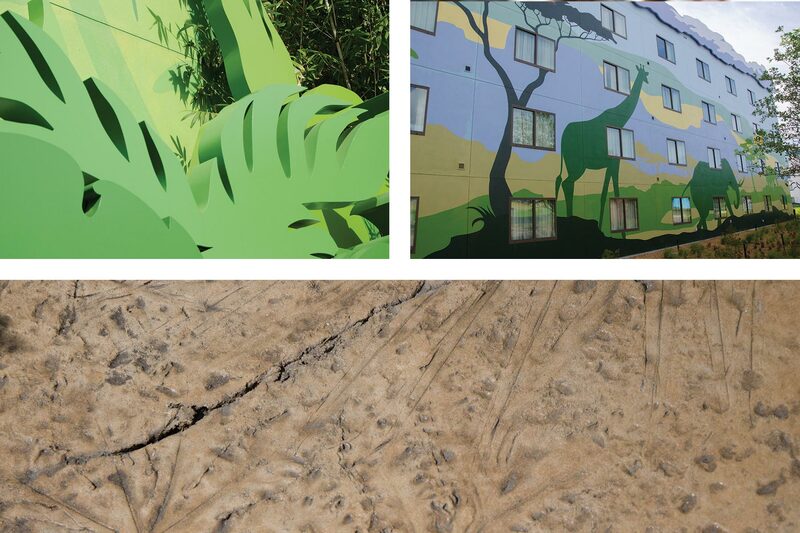 There are four sections of Art of Animation and they are each themed to different Disney or Pixar animated films. 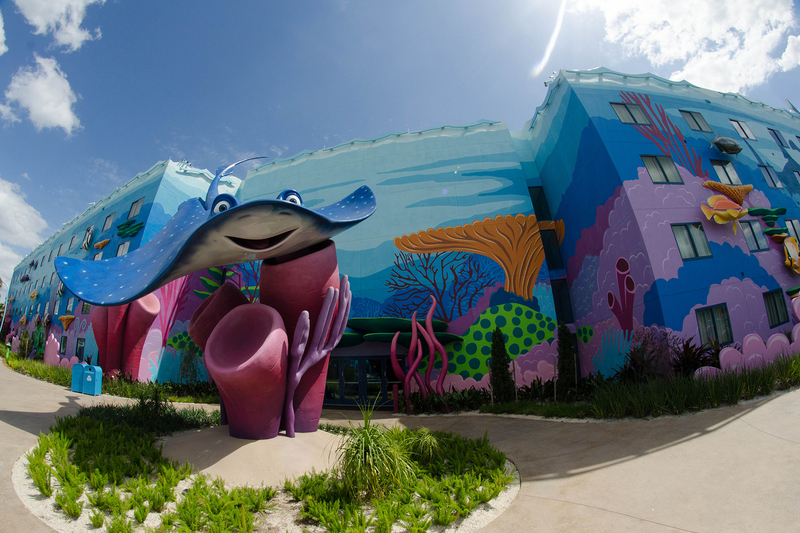 The room buildings that make up the current The Little Mermaid wing are the oldest at the resort which were part of the original resort construction, and then the only ones that feature traditional Value Resort rooms and outside facing doors. 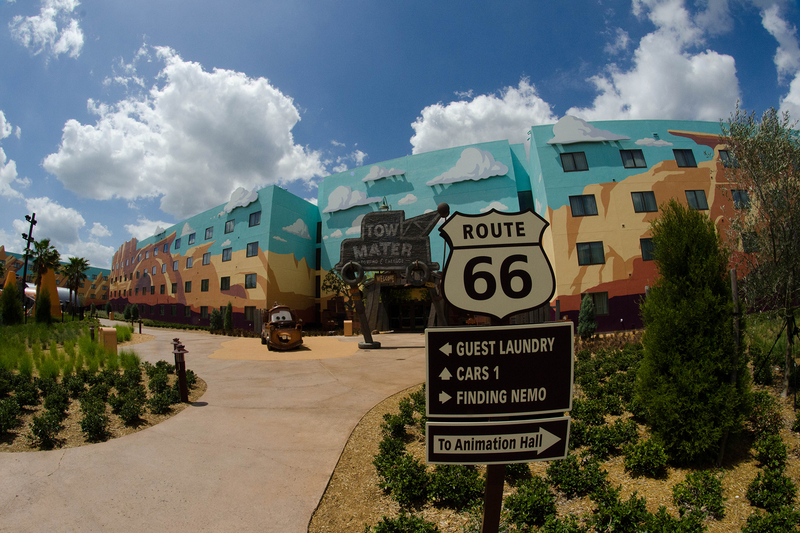 The Finding Nemo, The Lion King and Cars wings all contain family suites that have indoor hallways and doors. 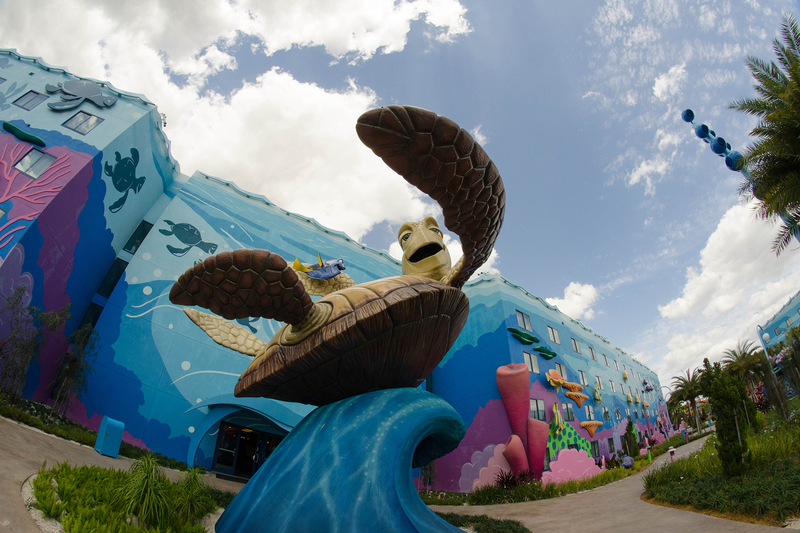 In addition to the four themed sections of Art of Animation, the entire resort is designed to mimic the process of creating an animated film. 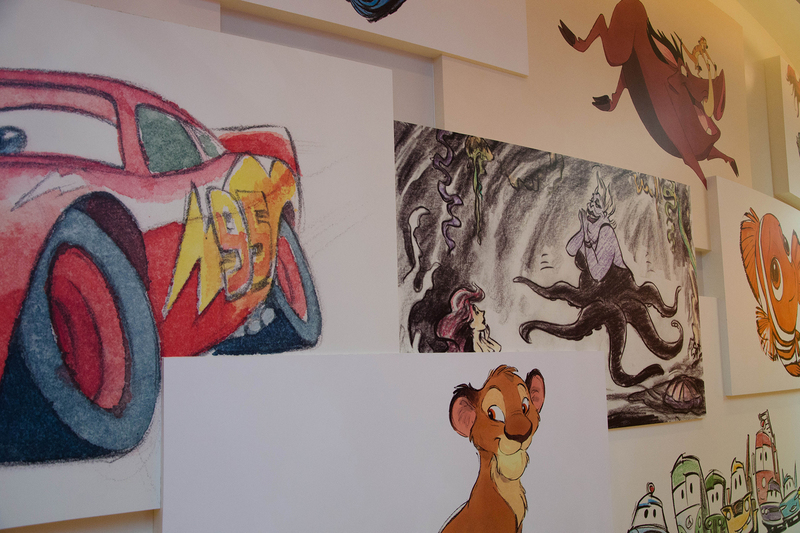 For example, the lobby walls are lined with concept artwork from each of the four movies and even some characters in earlier versions or forms. 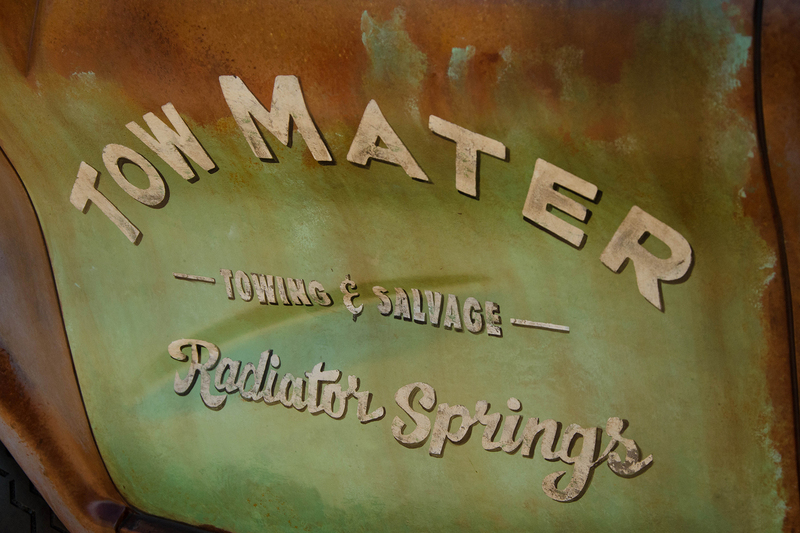 This is to signify a movie’s earliest form as you first step into the resort. 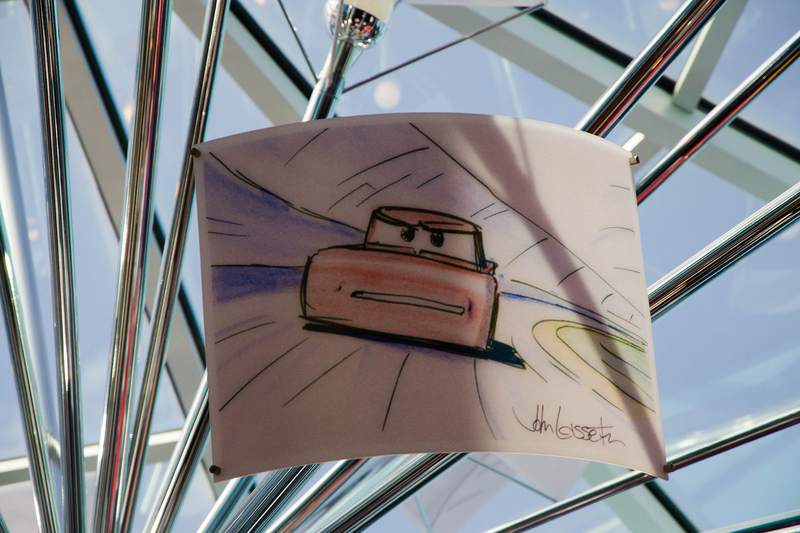 The light fixture in the main building even features an animation cell or storyboard artwork from Disney•Pixar’s Cars drawn and signed by John Lasseter, the head of Walt Disney Animation. 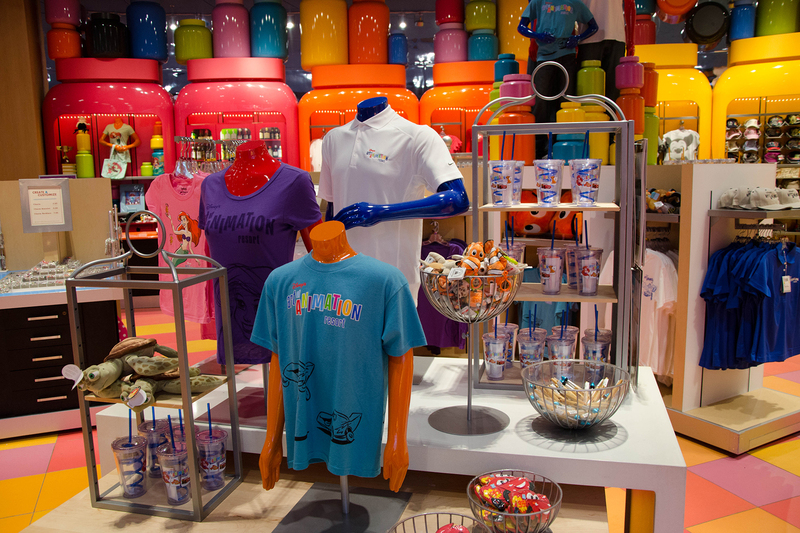 When you move into the merchandise shop in the resort, Inkwells, the design is meant to portray a traditional inkwell used by animators to add color to the animation cells. You’ll see different containers of colors along the wall and even some paintbrushes. Then as you move into the food court, Landscape of Flavors, everything is themed to background artwork, which sets the scene for each of the movies. 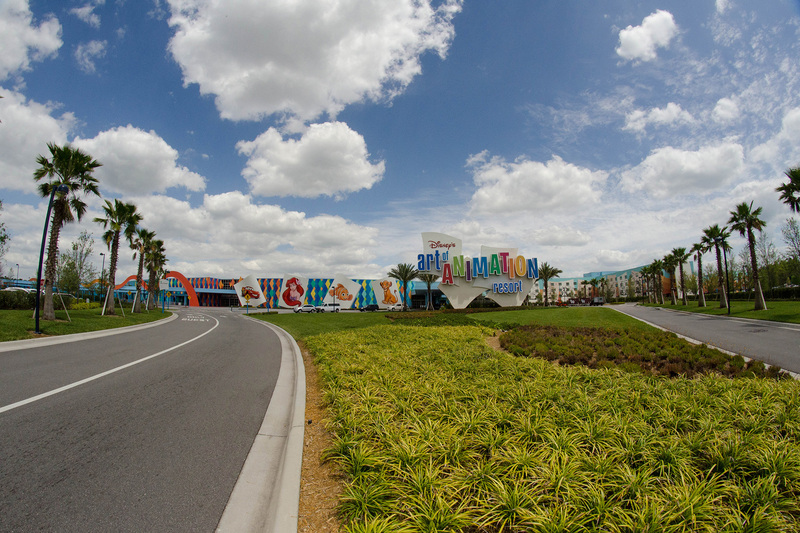 Finally, when you step out of the main building, you are in the completed movie and totally immersed in Finding Nemo, Cars, The Lion King and The Little Mermaid. 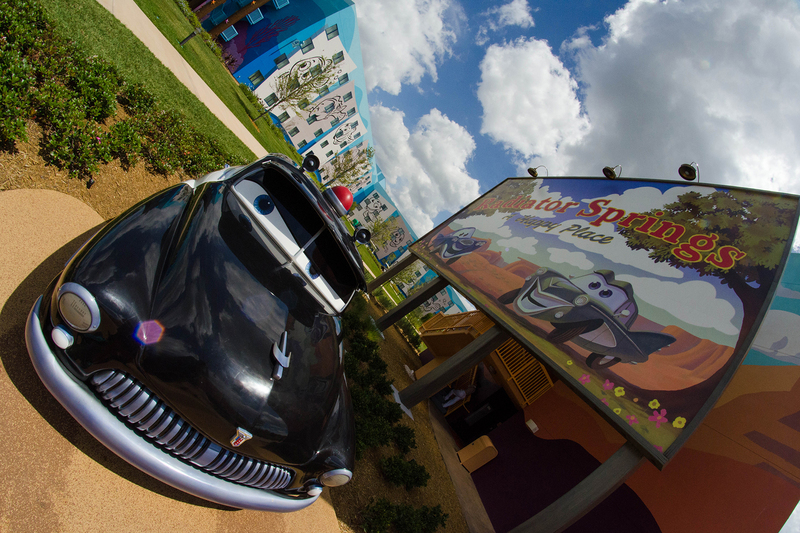 The Cars section of this resort is one of the most immersive areas in any of the Value Resorts on Disney property. 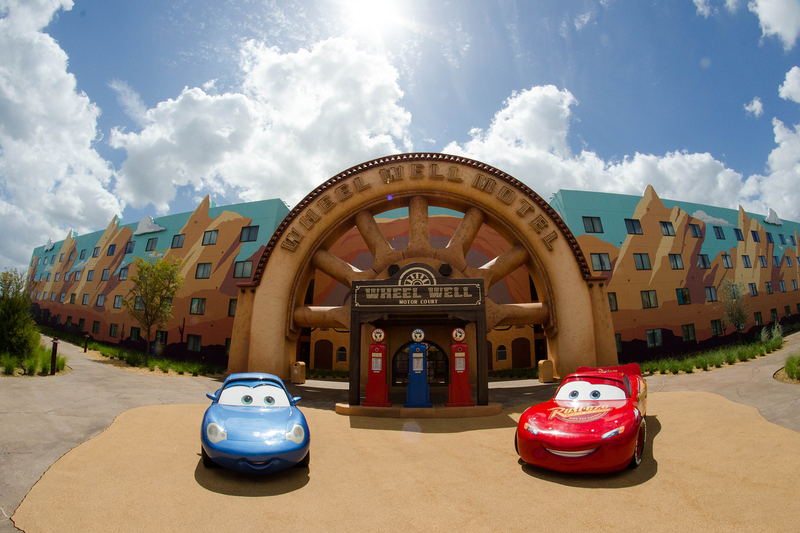 I see it as almost a smaller Cars Land that allows guest at Walt Disney World to get a taste of the real thing – minus the attractions of course. The details in this section, as well as the other three help to create that feeling of actually stepping into the movie. 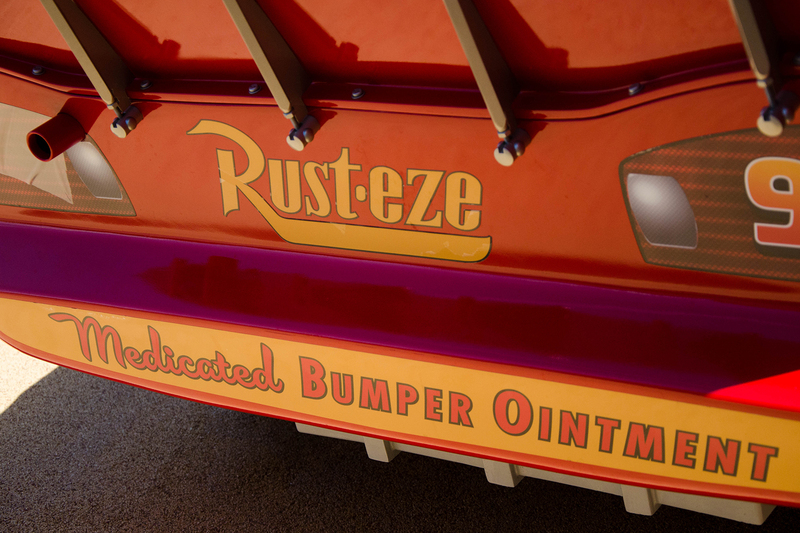 License plates and stickers that are placed on different things make it fun to look around and spot some of the jokes that are hidden throughout the Cars section. 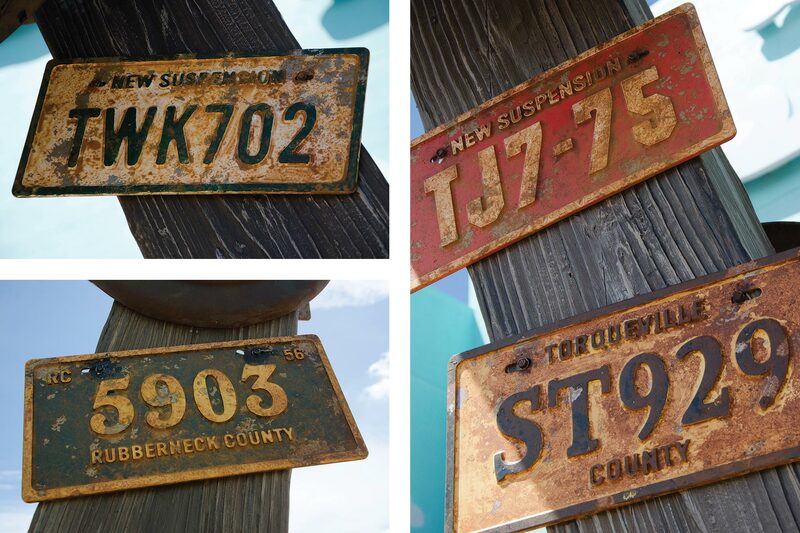 ‘Rubberneck County’ is a personal favorite. The colors in the Finding Nemo section make the separation between it and the other nearby wings so distinct. As with the other Value Resorts, huge character statues are placed at the buildings, however I think the level of detail on these is so much higher. Also, because these rooms have inside doors, it allows the outside of the buildings to act more like a canvas for paint treatments artwork. 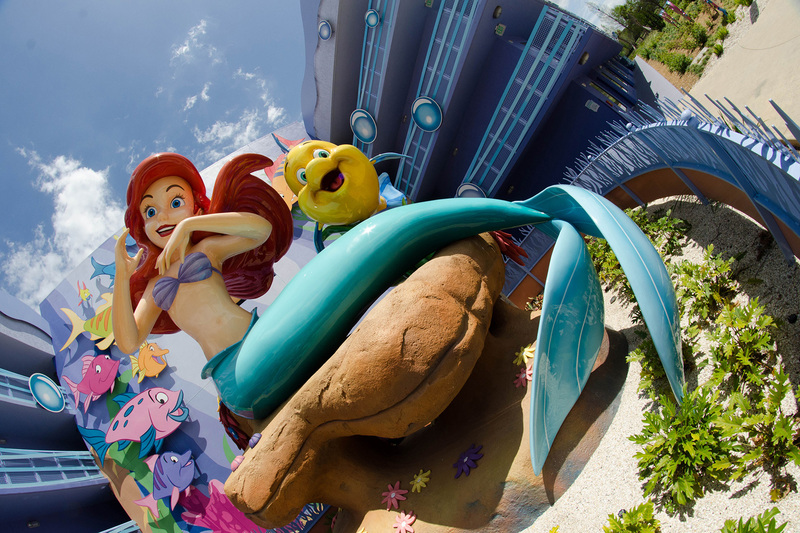 The Little Mermaid section also has the large colorful statues near each building, but the feeling is a little more similar Pop Century or the All Stars because they were built close to the same time. 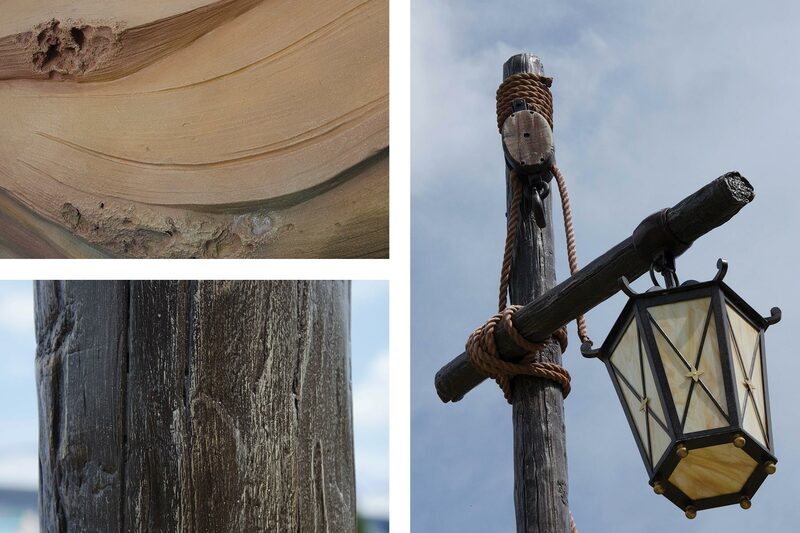 It’s still really fun to walk around and see the details though and there are more than a few great photo opportunities. Finally, The Lion King section is one of the most fun, especially for fans of the movie. The scenes portrayed in this section are woven through the walkway between the buildings so you have to walk near and around them. It makes it really fun to stop and take photos. 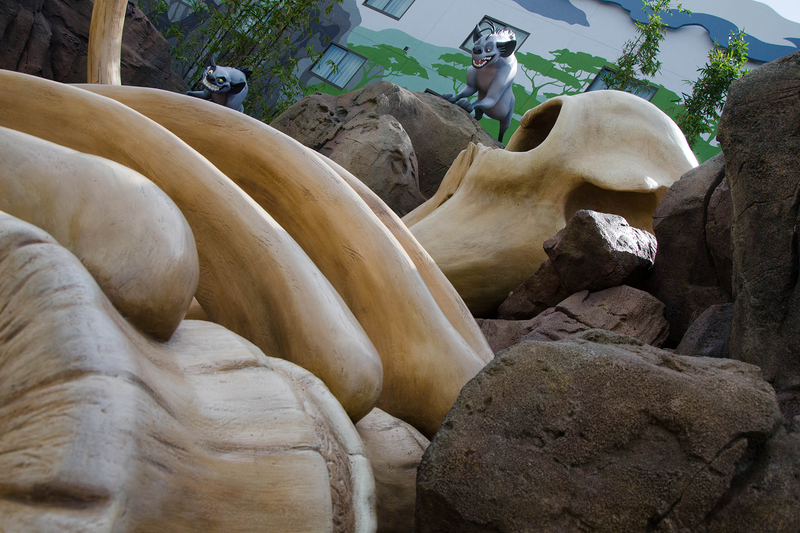 There is even a huge replica of the elephant graveyard which is a play area for kids – it even has a soft rubber floor and tunnel to run through. It’s also a good spot to do your best Whoopi Goldberg impression. 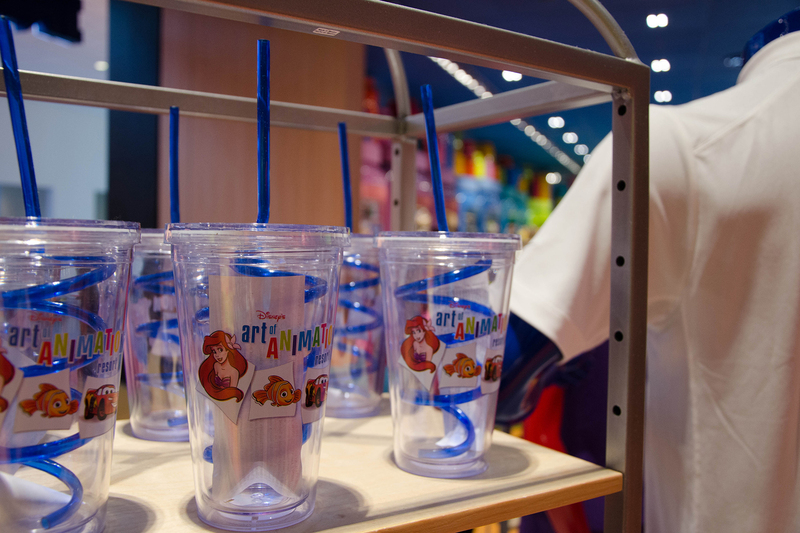 Art of Animation is also the only Value Resort to have custom resort-specific merchandise for purchase in their shop. 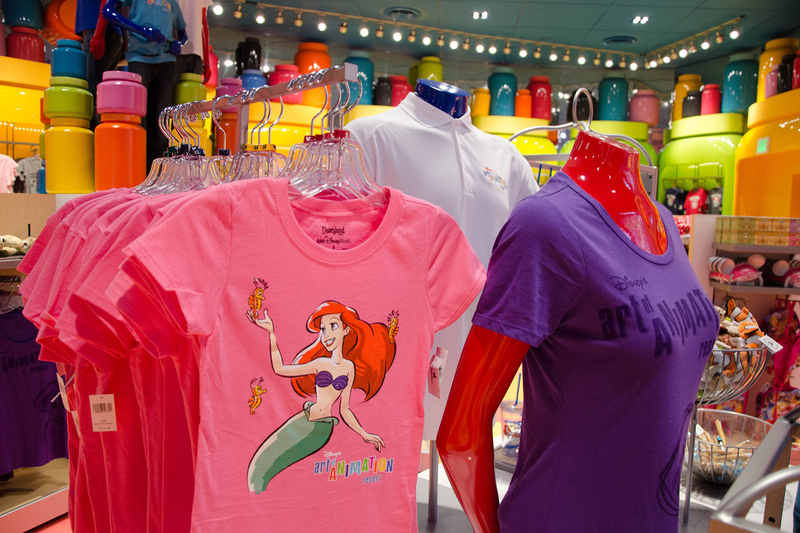 Typically resort-specific merchandise can only be found at Deluxe or DVC Resorts. 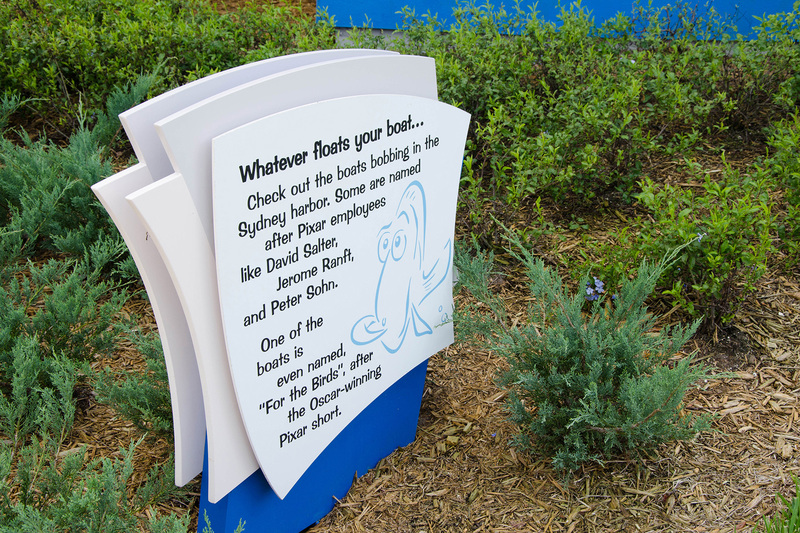 In addition to walking through each of the four movie designed sections of Art of Animation, one cool thing is to take the outside path of the resort along the water and read some of the trivia facts printed on paper placards along the path. Some are a little more obvious than others, but there is some cool information that you can learn about the movies represented. 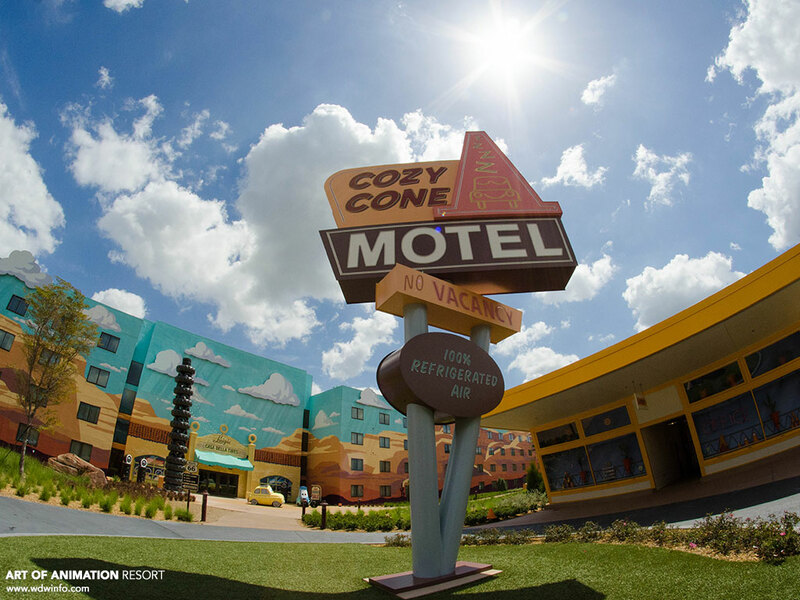 As a treat today, we have a desktop wallpaper featuring one of my favorite views at Art of Animation Resort. You can download for your computer, iPhone, or iPad. Hope you like them – enjoy! 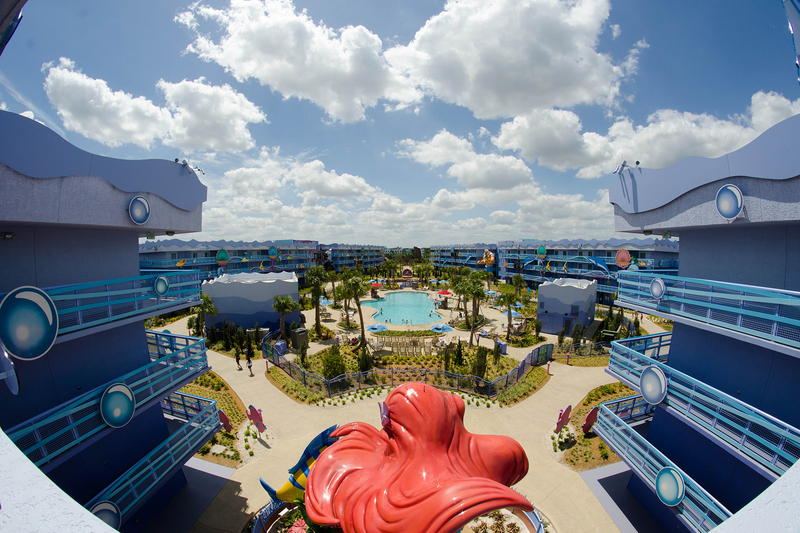 Well, that will do it for Day One of ‘7 Walt Disney World Resorts in 7 Days – Part Deux!’ Have any tips on Art of Animation Resort? Share them with us in the comments below! 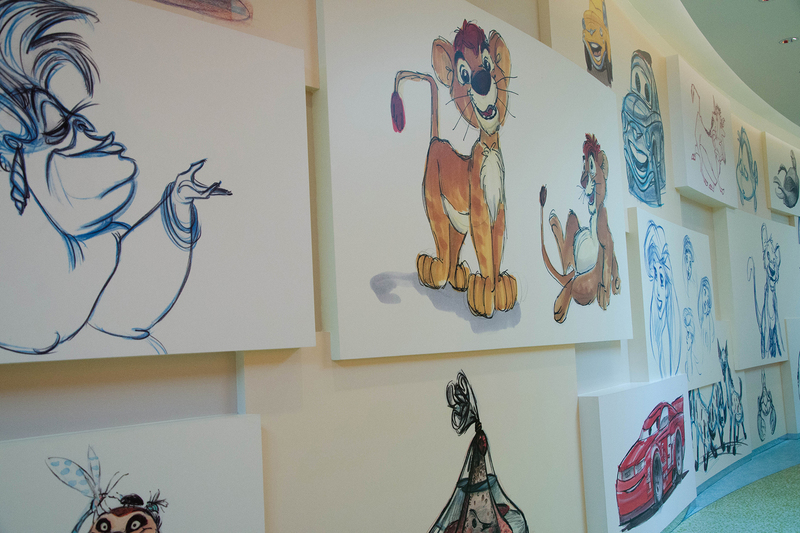 Be sure to check out our other Art of Animation coverage including our DIS Unplugged segment and our overview videos! 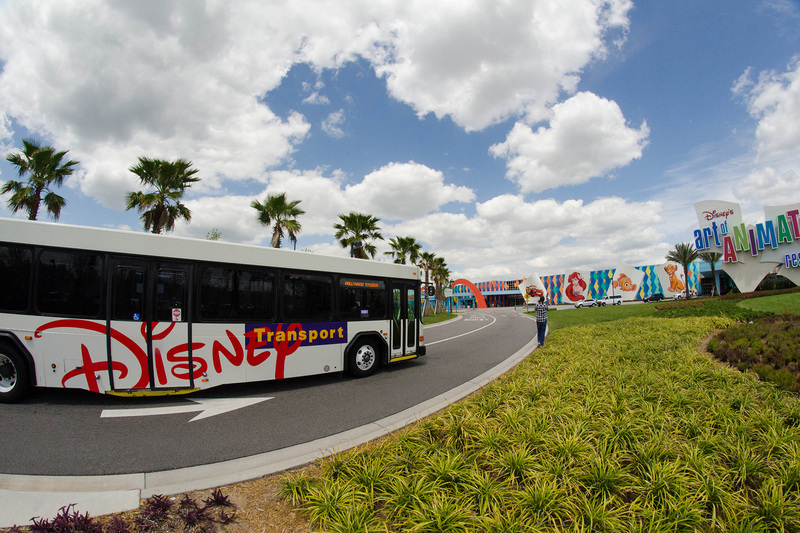 Also, be sure to follow us on Facebook and Twitter to find out all the latest Disney news from The DIS! 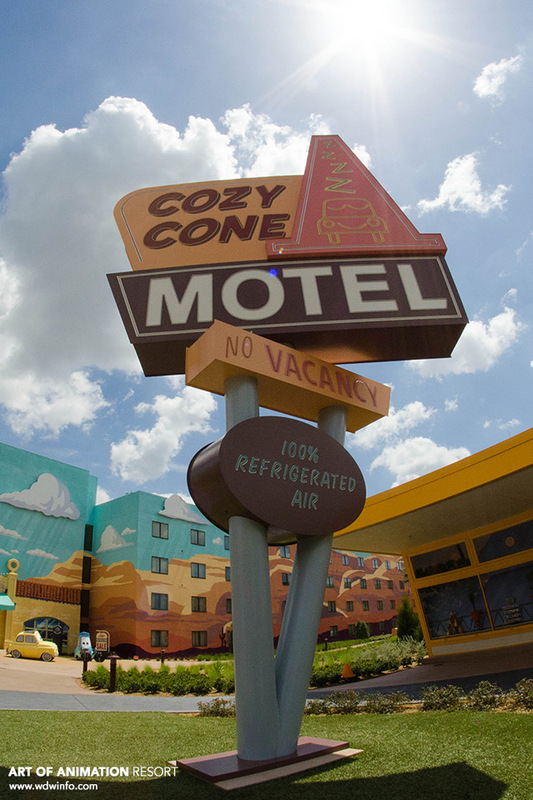 Tune in next week as we cover two more Walt Disney Resorts! 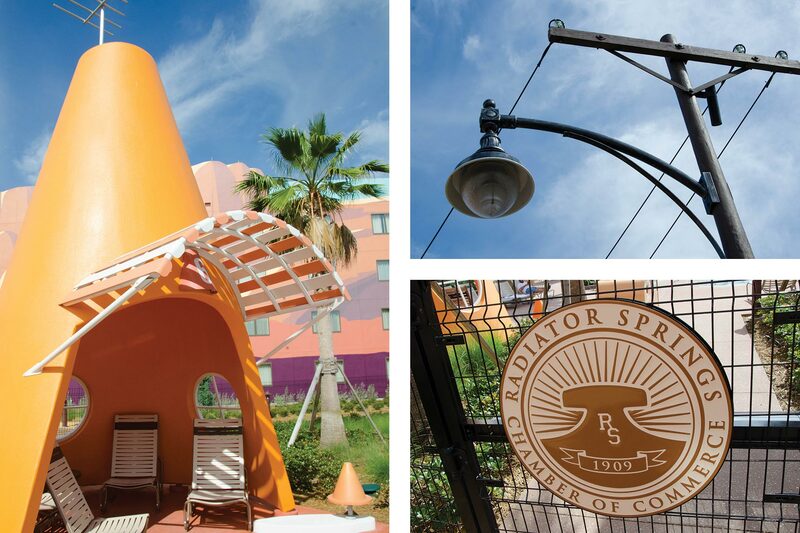 We will be staying at AoA in November this year, I can not wait!! Thank you for this post it is great seeing it all!